A Trio of Owls - What a Hoot! ​This delightful trio of Carnival Glass owls was discovered in 2015 by Angie Thistlewood. All three of these owls are beautifully iridised, and they are hollow and very light. They were blow-moulded and made upside down. Their moulds were very possibly wooden (cheaper and quicker to produce). The bases of all three owls (which would have been attached to the punty) are all ground and fitted with firm covers to allow them to stand upright. The cover on the small owl is glass, while the two marigold owls have a felt covered flat base. ​The tallest of the three owls is 8¾ inches high and it is rather bulbous in form, while the middle sized owl stands 7¼ inches high and is not as wide or deep (it is more oval in cross section). Both of these are marigold and have excellent iridescence. The smallest owl in the trio stands 5½ inches high, measured to the very topmost point of his (or her) little, pointed ears. This cute owl, shown on the immediate right, has a pastel iridescence over a translucent, moonstone-like base glass. Recently (August 2017), a 5½ inch owl has been reported in smoke coloured Carnival Glass with graduated iridescence (it's heavy at the bottom but none on the head) - shown far right. It is very different in shape and style to the moonstone version, and it was found by Caroline Griffiths and posted to our Carnival Glass Network Facebook Group. Small size, 5½ inches in smoke. 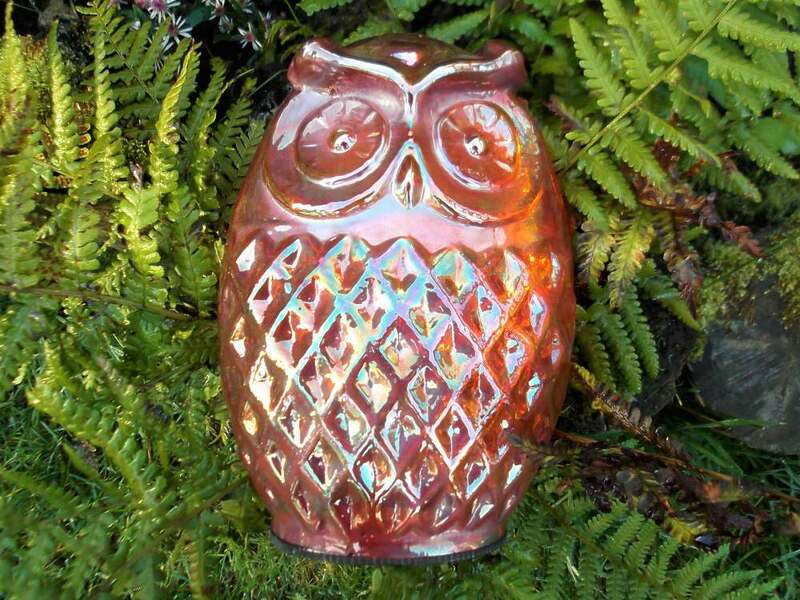 ​Lynne Martin also owns one of these fascinating owls. Lynne’s is the middle sized owl, and hers also has a splendid pumpkin iridescence. Lynne’s lovely photos show the back of the owl as well as the front. All three owls carry a secret hidden away under their bases in the form of a small sticker that reads, “Made In India” (shown, far right). ​The tallest owl also has an adornment – a necklace fashioned from string and a brown card label in the decorative shape of an elephant, which also reads “Made In India” (shown, right). So, we know they were produced in India, but can we specify a maker? We think we can … Meeco Autolens of Firozobad. ​A major exporter, the company was established in 1972 and primarily produces (as the name suggests) auto glass such as head lamps. Located in the main Indian glass producing area of Firozabad where the Jain Company and others were also based, Meeco Autoglass also specialised in decorative glassware – the owls are one of their “art glass” lines. As Contemporary Carnival Glass, the owls are exotic, fun and frankly delightful. Beautifully iridised and attractively quirky, they are undeniably great “conversation pieces”. 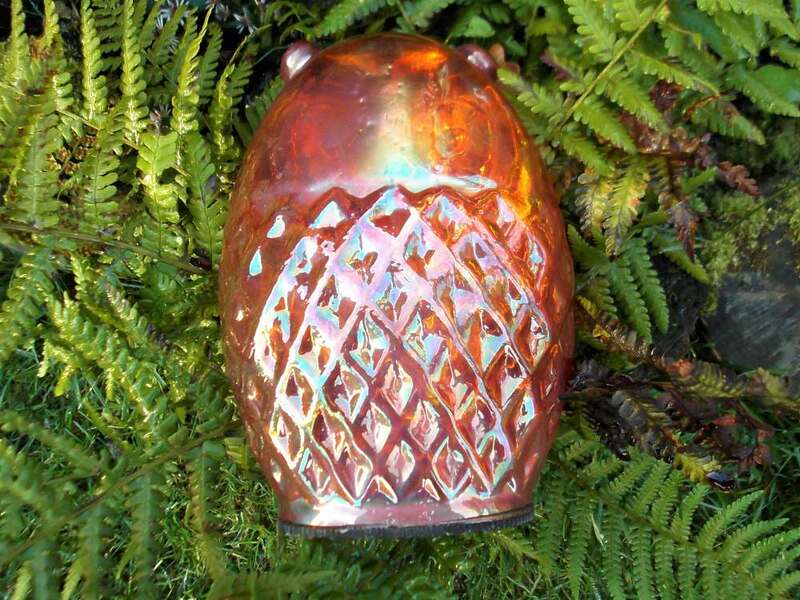 This jug is not iridised; it is amber coloured with a clear applied handle. It is 6 inches tall, very heavy and chunky. There is a polished pontil mark on the base, and more importantly, a label that reads "Made in China". Given what we know about iridised glass being made in the Far East, it is possible that these jugs may at some point appear in Carnival Glass. One to be aware of.